We live in a constantly changing world. With Unified Communications, Social Media, and ever-present connectivity with data being accessed across multiple channels, crafting the best Web strategy is absolutely critical. Given the environment, the Web is no longer based on an approach of blindly setting up a website and simply expecting the site to generate traffic and/or results to a business or entity. Also, users are far more sophisticated and selective when consuming content. Finally, given the multiple channels available, going to the Web has become a much more careful process. 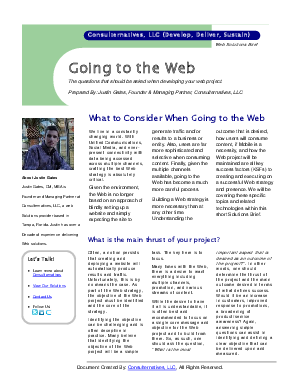 Building a Web strategy is more necessary than at any other time. Understanding the outcome that is desired, how users will consume content, if Mobile is a necessity, and how the Web project will be maintained are all key success factors (KSFs) to creating and executing on a successful Web strategy and presence. We will be covering these specific topics and related technologies within this short Solutions Brief.